The best choice for finishing a wood deck is to use an exterior wood stain. A semi-transparent penetrating stain will provide adequate water and sun protection. This type of deck stain will enhance the natural beauty of the wood increasing its appearance. When refinishing a deck, do not use a varathane, varnish, or polyurethane coating that films on top of the wood, creating a “shiny” finish. These types of finishes are mainly used for indoor applications and break down easily when exposed to the elements. Rain and harsh UV rays will cause polyurethane to fail quickly, which will subject the wood to weathering. The polyurethane will blister and peel on exterior wood. This will create a nightmare to fix where heavy sanding will be involved in the removal. If you want a clear or natural look to your deck, consider a deep penetrating (non-filming) clear deck sealer or better yet a semi-transparent deck stain in a natural tone. When looking for the right deck stain you will find a large variety of colors. Finding a color like Natural, Cedar, or Redwood in a semi-transparent stain will not hide the wood grain as a solid stain or paint would. This can give your deck the natural look you desire while still giving the wood moisture and UV protection. Do some research on your deck’s type of wood. Search for colors that will give you the final results you want. Do not apply polyurethane to a deck or it may jeopardize the deck’s beauty and longevity. The outdoor elements are too harsh for polyurethane making it a bad choice for exterior deck use. Keep your deck maintained with the proper choice of deck stain and it will be there for you to enjoy for many years ahead. We built a porch with ezy breeze windows room over new deck, treated pine wood flooring. We want to use an oil stain on the floor and protect it with a satin coating. What is the protective finish we should use, or oil based stain enough? I live in cold and snow country. My deck is 5 years old and every year, I have to re-stain it. I have used everything. that will last. Seeing the wood through the stain is not important anymore. My deck looks horrible right now, and I want a clean and fresh look. A solid stain will peel in your environment most likely. In addition, prep is key. You will need to remove all the previous coatings for your new coating to work well. Applying a solid stain over previous coatings will not work well. Hi I’m looking to put something on my interior honey house deck, it is raw spruce plywood. It never sees sun or rain, but is walked on and gets wax/honey on it. What would you recommend? I am sorry but we do not have any experience with interior wood like this. Our experience is strictly outside wood and decks. My contractor put marine varnish on my new redwood deck and now dark discoloring seems to be happening. He said it needs another coat (after some sanding) to provide protection but I’m fearing that he made a big mistake and I might need to sand it off and start over. Help! Thanks. You will need to sand it all of and start over with a proper deck finish to fix this. Thanks for the help. I’m learning a lot! Would a polyurethane coat be suitable on decking that is partially outside? The laundry room is built on top of the decking and is enclosed on all sides. No, any exposed wood and the poly will peel. Hi, we are using black japan decking stain and wondering what we should use to seal it? Use a stain like the TWP 1500 or the Armstrong Clark. I’m a boy scout working on my eagle scout rank. For my eagle project I am going to be refinishing a couple of Redwood play structures. In the past, lacquer has been used but it has lasted less than a year before it starts pealing a bunch. Along with hot weather, the play structures are also bombarded with the water from some nearby sprinklers every other day. What would you suggest I use to refinish the structures? I’d like it to last as long as possible. Also what would the preparation and application process include? Thanks! You would have to power sand all the old lacquer off to fix this. Once fully sanded, you can use a penetrating stain. Try Armstrong Clark. Thanks! Also, will the penetrating stain keep water from soaking in and prevent splinters? Sweet, thank you! Also, I checked on the Armstrong Clarke website and according to it the semi-transparent stain will last about 2.5 years. What condition are they saying that the stain will be in after that time. Also, what is the reapplication procedure for when it comes time to reapply the stain? Thank you for your time! Just clean and recoat when needed. what is the best clear product that stands up to salt for open porch flooring? Try Defy Extreme Clear or TWP 1500 Clear. I find the stain I put on my deck does not adhere and any movement of furniture etc. goes through the stain exposing the pre stained deck. Is this the fault of the stain or my application? Depends on the brand of stain, how you prep, and or how you applied. It could be many different reasons while it is failing. I’m building a beach bar that previously had 2×6 flooring with a 1/8-1/4 inch space. I’m now going to use 1×6 tongue and grove on the bottom and second floor. I’d like to use a wood sealant that won’t wear very fast with heavy traffic with sandy feet and will help create a waterproof barrier between floors. What is my best option? Olympic Maxium? Polyurethane? Behr Deckover? Stain and water seal? With your heavy traffic, there is not a good solution for you that would last more than a year. You could use a semi-transparent filming stain like the Sikkens Cetol DEK, but you will be constantly maintaining it. I’m looking to protect wooden beehives from the elements, but I don’t want to use paint. I’d like to keep the natural beauty of the wood. Would a clear deck sealer be best or an exterior-grade polyurethane? I’ve already stained the boxes so the product would go over a stained surface. Hi Jarad, you cannot seal or coat over a exterior surface that has been “stained” already. Polys will peel as the article states. Wondering what would be the best polyurethane for a screened in Gazebo pressure treated floor? As the article states, never use a polyurethane for exterior wood. Is oil base stain better than water base? Does it last longer? What can I put on top of Behr’s paint/stain to prolong life in uncovered portion of porch? Thinking some type of polyurethane. You cannot apply anything on top of a deck stain to prolong the life. It will peel. my deck is painted, leaves are falling and staining the deck. is there anything that i can go over the paint that will stop this? maybe polyurethane? I had just finished powerwashing, sanding, and applied semi-transparent waterproof stain. Now thats its all done; Ive come across think about what to do with the cracks and small splits in the wood. I was thinking about polyurethane it. Now I’ve learn its not a good idea, any suggestion as to filling in the small cracks and splits to having a smoother surface? The filler will not work on exterior wood and semi-transparent stains. It will not blend. Just leave as is. 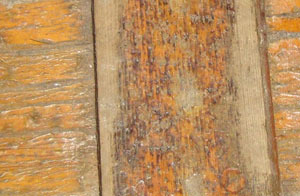 It is normal to have cracks with exterior wood. i am using superdeck semi transparent heart redwood stain on my 1 year old never touched pressure treated deck as i have seen nightmares about using Behrs. We have a very large deck, about 50’x10′ with railing. Last summer we cleaned the deck and added a water protectant. As the sealer dried we noticed several white spots, these continued to increase as time went on. I sanded off the white spots and tried to re-stain them. This is when I noticed the stain the former owner used had polyurethane in it. We have sanded the entire deck but I want to be sure I avoid having any further issues. I’m assuming I should pressure wash the deck again just to be sure it’s clean before I stain it. Is there anything else I should do? Use a wood brightener as well. My deck was painted by the previous owner with a solid stain that is now peeling and flaking. I am thinking I need to sand it all off and cover with semi-transparent stain as has been suggested. However, the nails used on the deck are not stainless steel and they rust if exposed to the air. Will the semi-transparent stain sufficiently cover the nails so the will not rust? I am worried that it will not, and I will have a deck dotted with hundreds of rusting nail heads. No, the new coating will not seal the nails and stop the rust. So is there any alternative to sanding and recoating with solid stain? Replace the wood is always on option, but expensive. I have a cedar deck that gets tons of sunlight. I tried all kinds of deck stains and even teak oil. The best product I found was something called a Super Deck. I rented deck sander at the hardware store. Used 80 grit followed by 120. I use an oil base stain that has to be reapplied about every three years because of a south exposure…nothing will last forever on a deck, if you want to "poly" it, I would use a high quality spar varnish used on boats, but again, you will have to sand it back down and re apply at some point. This was great information. I did what you said not to do and the results were exactly what you said would happen. Peeling and blister and now it's to the point the paint I used completely peeled and blistered away from the wood. Now I can just see the bare wood. This was a costly mistake since polyurethane is expensive. I have used an Exterior Solid Stain on a Pine Floor INSIDE. I'd like to put a top coat of some kind on it. Since this is not exposed to the elements, would a polyurethae coat work? You cannot apply anything on top nor would it help. It would make it blister and peel. Is there any kind of a deck coat/sealant that prolongs the life of the coating, or wood? We are considering redoing our deck with the Poly resin material/poly wood that lasts for life. But I thought I had heard somewhere that there is now some type of a deck coat/sealant that is somewhat similar to the long life of the poly material, so there is not a need to recoat as frequently. Please let me know; maybe I am way off base! Thank you. Hi , We installed a post and beam covered porch about 10 years ago using western red cedar beams and rails. We were told to just use a varathane clear oil based Exterior finish to seal and protect the wood. It looked fantastic at the time, but the last couple of years, it started to look like your picture in the article above. We tried for nearly a week to sand the wood back to pre-seal, and it just wouldn't come off. So I went to the paint store and they sold me a Benjamin Moore Exterior Stain Remove, which I tried on a portion of the post and beam/railings. It turned the wood dark in the places where there was no stain left, and bubbled up some of the remaining stain. It was a mess. We let it dry and tried to sand it again, but it just will not come back to the same colour. So we thought that perhaps if we used the same product to just go over the wood, it would blend in and look ok….it is still wet, but it looks like it isn't going to work. I am afraid that our only option is going to be to paint the post and beam, which I really don't want to do as it is beautiful Red Cedar. Can you help with some advise? You have to remove and the only effective way of doing this is to continue to sand. Try a belt sander. You might want to hire someone as well. After the sanding, you may need to apply a wood brightener. This will lighten the wood and also remove the dark spots that the stripper left. After all this is done, use a lightly pigmented penetrating stain like TWP or Armstrong Clark. Not really as they will peel if shiny. Bad idea. We recently had our wood deck stained and sealed. The company we hired said their seal is mixed in with the stain and is applied in one process. I'm just curious if that sounds right? Also, now that they are finished with our deck, should water continue to soak right into the wood when it rains or should there be more of a beading of the water on top of the deck? Beading is not important. It should \”shed\” the water. Sealers and stains are mixed. I put a clear coat of stain to my cedar deck and it left a yellow look where the stain overlapped. How do I get rid of the yellow look. Strip it all off and start over. You mention several times Do Not use poly but you never mention what you should use. Would you recommend an oil base product such as; Sherwin Williams semi transparent cedar deck stain. This whole site is all about what we suggest and in general that is a penetrating semi-transparent stain that does not peel. Please see ratings on our site. My wife is wanting to put a coat of polyurethane over the stain; not so much for the gloss finish, but rather to protect the wood itself from additional stains (melted popsicles, spilled wine, etc.) Im not convinced this is the best approach, as it may cause the porch to be slippery when wet. I also thought that the stain itself would provide a decent barrier so long as I continue to take care of it each season. Thoughts on applying this finish over the stain? You cannot add a coating of any kind over top of a deck stain. It will not work. Hi there. I have applied a dark varnish to my wooden deck, but it hasn't come out as dark as I wanted it. Is there any stain / tint I can apply over the varnish to make it darker? Is there a difference between urethane and polyurethane? This can (solid color composite deck stain) only refers to urethane, but the clerk called it polyurethane. She also claimed it could be used for conventional wood decks and could be painted over with latex paint. This product was applied to a wood deck previously painted with latex. INGREDIENTS: Nepheline Syenite, Long Oil Alkyd Resin, Exempt Mineral Spirits, Long Oil Alkyd, Mineral spirits, Urethane Alkyd resin, Xylene, Proprietary Solvent and Ethylbenzene. This product was discontinued due to "harmful formulation" and deep discounted. I was told it can be thinned with standard paint thinner, and if a coarse surface was desired sand can be added. I expect it to exhibit better longevity than latex coating, which would peel in areas after a year or two. What brand and type is this product? I want a wet look or shiny finish to our cedar deck. How can I archive this that will hold up. Obviously poly sounds like a no go..any other sealer to put ontop of the stain or something I can use. We are staining it a dark brown and its a brand new cedar deck. Thanks. You cannot achieve this without major problems down the road. It is just going to create issues. You have to prep before reapplying. Sanding is not always the best prep. A good deck cleaner and wood brightener works better. Does an older deck need some sort of preparation before staining? Cleaned and brightened for the prep.